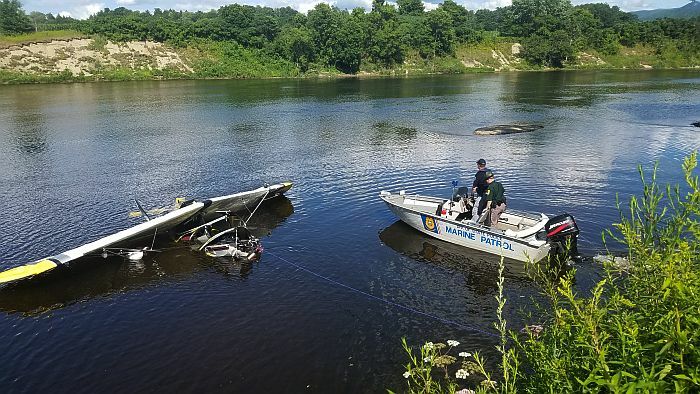 Haverhill NH – On Sunday, July 29, 2018 at approximately 1:18 PM, Troopers from NH State Police, Troop F responded to a small aircraft crash into the Connecticut River in Haverhill NH. At approximately 12:36 pm, the aircraft, a small amphibious experimental was attempting to land in the river near Haverhill, NH and crashed into the river. The aircraft was carrying one pilot and one passenger, who were both injured. One occupant was transported by helicopter to the Dartmouth-Hitchcock Medical Center, with serious injuries, but is currently stable. The other occupant was transported by ambulance to Cottage Hospital in Woodsville, NH. A pilot traveling in a similar aircraft and a tour helicopter from the nearby Haverhill Fair, along with the Newbury, VT Fire Department, and Vermont State Police provided assistance at the scene. The cause of the crash is under investigation by the NH State Police, NH Marine Patrol, and the Federal Aviation Administration. Anyone with any information is encouraged to contact Trooper Alex Peplinski at 603-227-0076 or alex.peplinski@dos.nh.gov.